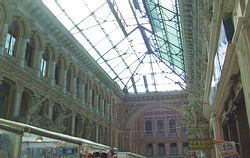 The Passage was built in the end of the 19. century as a hotel and a shopping center. This combination was at that time quite common in European cities. Both hotel and shopping center still exist today, but both have seen more glorious times in the past.